Ross Keymer smacked eight sixes in an innings of 97 to power Ufford Park into the final of the Stamford KO Shield tonight (July 11). Keymer’s knock enabled Ufford to reach 194-6 in their 20 overs against Burghley Park. The home side won the game by seven runs after fighting back hard in the second half of Burghley’s innings. Gary Hook (57) and David Platt (51) smashed Burghley to 85-0 in seven overs, but three wickets from Will Dallas. who returned to the fray after seeing 22 hammered off his first over, and two wickets for that man Keymer checked the visitors’ progress. 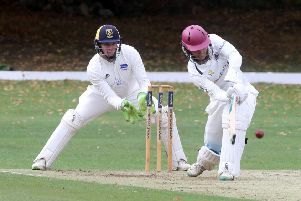 Wahid Javed struck 35 for Ufford and captain Andy Larkin made 33. It was a welcome return to action for Larkin just three days after suffering a serious facial injury when felled by a bouncer in the Burghley Sixes final. Ufford now meet Ketton in the final at Market Deeping CC, on Wednesday, July 20 (6.15pm). Ketton play Bourne in the final of the Stamford Charity Cup this Wednesday (July 13) at Stamford Town CC. Ufford Park 194-6 (R. Keymer 97, W. Javed 35, A. Larkin 33, S. Nichols 2-25, G. Hook 2-61). Burghley Park 187-9 (G. Hook 57, D. Platt 51,. B. Hancock 20, W. Dallas 3-32, R. Keymer 2-25).